Magnificent antique two volume set of the Works of William Shakespeare published in the late 1800s or very early 1900s. 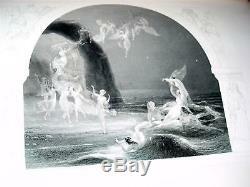 These very large volumes measure 11 x 15 and are 2-3/4, containing 57 exquisite engravings/plates. 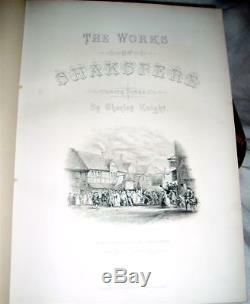 This unique and rare set of books is titled The Works of Shakspere by Charles Knight. These books contain extraordinary contents, the works of Shakespeare enhanced by some very important engravings of historical importance. This is a work of great magnitude and is considered an incomparable compilation of Shakespeare, altogether out of the commonplace. A definitive work and a tangible record of Shakepeares literary genius and the stunning works of art his works have inspired. TITLE: The Works of Shakspere. PUBLISHER: Virtue & Yorston, very early 1900s or late 1800s. 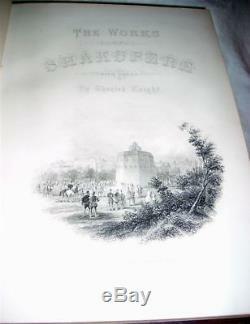 "Imperial Edition" edited, with notes and biography of Shakespeare, by Charles Knight. Illustrated with full-page steel engravings. I, 810 pp, plus 94 pages in biography, illustrated with 34 plates including frontis, vignettes and portraits. II, 777 pp, plus 93 pages in bio and appendix, with 23 plates. Bound in dark-brown leather and maroon cloth, lots of gilt on the spine and beautifully marbled endpapers. Antique hardcover books have leather spine and leather corners, book is embellished with gold lines along edges, gold lettering on the spine and some beautiful Victorian embellishments on the spine. The book has edge and corner wear, also some wear at the top and bottom of the spine. Book cover is secure, pages intact and in excellent, pristine, like new condition. Some surface wear on the covers includes two places on the front cover of Vol. 1 and on the back of Vol. II where the cloth is pulling away from the leather, needs repair. Some surface wear on the covers that includes some scuffing, light surface scratches, some small random marks. There is wear and rubbing on most of the edges and along the spine, see photos. Extremities rubbed in both volumes. Previous owner's name is written on the back of the front fly-leaf of Volume 1 and 2. Engraved plates are sharp and clean. Attn: International Customers, please do not pay for your item until we invoice you. We'll be glad to help. 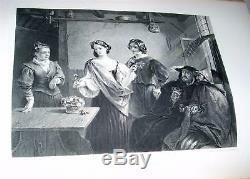 The item "Rare ANTIQUE WORKS of SHAKSPERE Shakespeare C. Knight Engravings Vintage" is in sale since Thursday, December 17, 2015. 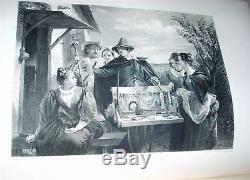 This item is in the category "Books\Antiquarian & Collectible".antiques" and is located in Lehighton, Pennsylvania.